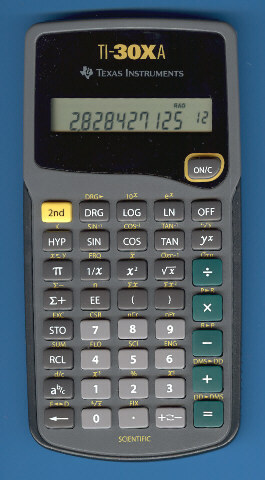 This TI-30XA is almost identical with the TI-30Xa introduced already in 1996. This calculator was manufactured by Kinpo Electronics, Inc. in January 2004 and dismantling it reveals indeed a well known internal construction. Please notice the SR-30 logo on the printed circuit board (PCB). Read more about the Logarithm Bug and its side effect on the related yx function present in this calculator. Please notice that the bug was still present in a TI-30XA manufactured in 2007. It took more than twelve years from its introduction in 1996 till we noticed a major redesign of the TI-30Xa, don't miss the TI-30XA (2009). Don't miss the redesigned TI-30X IIS and all-new TI-36X SOLAR.